The Spring schedule has been busy. We spent much of the spring continuing the sorting process for LFB, fine tuning the AC, stabilizers, auto pilot, electrical system., etc. A few weeks ago we picked up some guests in North Palm Beach and ran them over to West End with a final drop off in Marsh Harbour. Boat is feeling really dialed in and the trip over to Marsh Harbour was smooth, with one little problem. Could have been a big problem; the solution was simple, but not easy. Coming into a marina with the wing engine fired up and hydraulic system powered up low pressure alarms started going off in the pilot house. Captain got into the slip ok and then continued the investigation. No sign of trouble in the engine room, but the front “basement” was full of hydraulic fluid. First thought – we split a hose. With some assistance from one of our guests the captain determined that the problem was not a hose but instead we had fluid shooting out of the bottom of a major hydraulic block in the front equipment area whenever the system was activated. Initial diagnosis – a split block. A call to Nordhavn, followed by a call to ABT (they did all the hydraulics on the boat) provided a different diagnosis, likely a plug or o-ring in the bottom of the block had failed. ABT said they have never had a block fail. After a couple of hours of disconnecting hoses and removing the block from its mount the captain turned it over and saw that a plug for an unused port had, over 10 years, vibrated loose. He could turn the plug with his fingers. He pulled a new o-ring out of our spare parts locker, tightened the plug back, remounted the block and reconnected all the hoses. Filled the fluid reservoir, fired up the system, all is good. Cleaned up the mess in the forward engine compartment and we are likely good for another 10 years. A simple fix, but not easy! 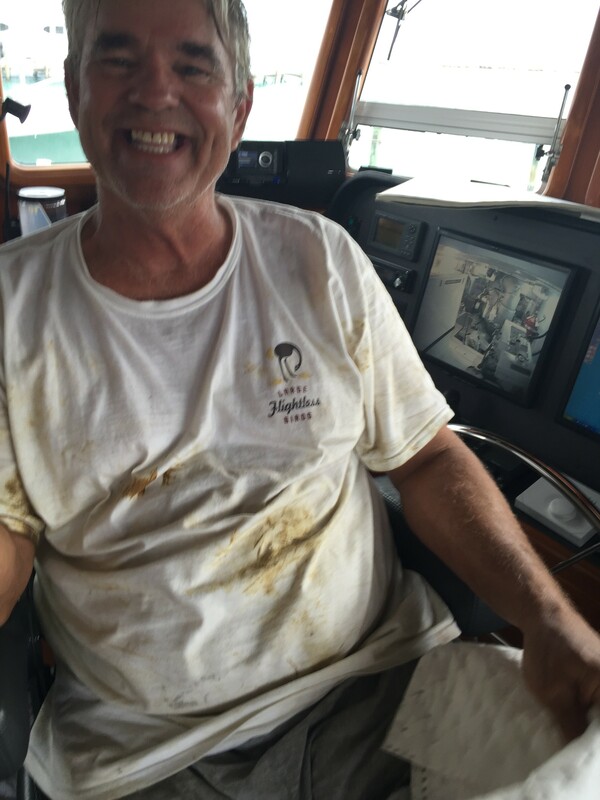 The front equipment room on a N55 is pretty narrow, so we don’t have pictures of the repair under way, but one of our guests took a picture of the captain once he was done . . got oil all over one of our limited edition LFB t-shirts. I’m gonna have to dock him for the shirt.